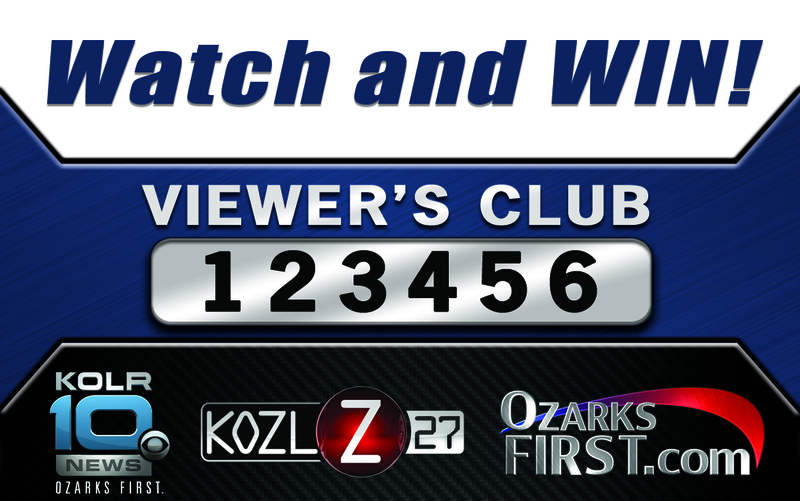 KOLR 10, KOZL and Ozarksfirst.com are giving away more money than ever before with our BIGGER, BETTER Viewer's Club Promotion! Just watch the KOLR 10 5 p.m. News, 6 p.m. News, the KOLR 10 9 p.m. News on KOZL or the KOLR 10 10 p.m. News every weekday (Monday - Friday) to see if you're Viewers Club Card number is the lucky winner!!! The Cash Jackpot starts out at $100 and grows by $100 every weekday that the prize isn't claimed. You could win over $2000 if no one claims the prize for 20+ consecutive weekdays! 4. At any local, live KOLR 10 Viewer's Club event (KOLR 10 Weathertour, the ManShow, Baconfest, MO Food Truckfest, Hot Rod Holiday etc). One nightly VCC number will be drawn and broadcast in the 5 p.m., 6 p.m., 9 p.m. and the 10 p.m. newscast. To claim a prize, the registered card holder must contact KOLR10 at (417) 862-1010 between 8 a.m. - 5 p.m. the following business day.